The Goddess of the Yangtze is gone. She left us. Our abandonment of her caused her to go. She will never return. Our actions have sent her away…forever. 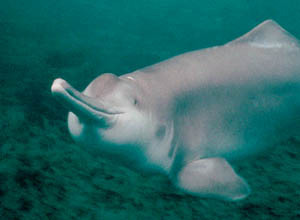 The Yangtze River Dolphin has just been declared extinct. Only we are responsible for this. Our unmitigated demand for cheap goods from China has caused the Yangtze River to become the busiest river in the world. “To blame for its demise is the increasing number of container ships that use the Yangtze, as well as the fishermen whose nets became an inadvertent hazard. We need to be mindful that our actions affect everything. Try to be aware of where your stuff comes from, and try to buy local. It will help in the long run. I am trying to do this, it is not easy, but if we create the demand the supply will follow.